There is always two ways to look at everything. This past week has been a bit exhausting, yes. You know what else it’s been? Productive! That’s the positive perspective. Managed to sit down and have family movie night! Although the home progress was exponentially exciting, I have to say the best part of the week was family movie night. We watched ‘Baby Driver’ and, y’all, I liked it way more than I thought I would. It looked good and got fantastic ratings, but I wasn’t sure if I would get wrapped up in it or not. I was actually planning to browse Pinterest during the movie for new recipe ideas, but never even opened my laptop. Allen and Hailey had the same feedback; they also liked it more than they thought it would. The movie is plain entertaining with an awesome opening scene and the music selections throughout the entire film are on point. If you haven’t seen it and you’re curious, rent it. With another work week about to begin (already? ), I took some time today to do a little cooking that will double as lunches and snacks for a few days. Busy times call for meals that are quick to throw together and make plenty for leftovers. Stuffed shells are on the menu tomorrow for the same reasons. This pasta salad recipe has been saved on my phone for a minimum of two months and I’m really glad I got around to it today, because it turned out to taste as good as it looked! I found the recipe on foodiecrush.com, another awesome food blog I urge you all to check out! This recipe has a little bit of a different take on traditional pasta salad which is what intrigued me about it. Usually I do your typical pasta noodles with bell peppers, mozzarella cheese, tomatoes, olives, pepperoni and Italian dressing. I’m pretty sure it’s been served at every family cookout, reunion, graduation or pool party I’ve attended. And for good reason, it’s yummy! However, it is fun to change things up a bit now and then. Prep work is pretty simple. I rinsed, sliced or diced the beans, olives, onion, cheese, spinach, herbs, tomatoes and meat and put it in the fridge to keep cool. While cooking the noodles, I mixed up the dressing ingredients – mayo, white wine vinegar, dijon mustard, sugar, salt, pepper and oregano. Prep and add salami, beans, tomatoes, olives, spinach, cheese, onion and herbs to an extra large mixing bowl. Set aside. Cook noodles according to directions on package. Drain and rinse with cool water. Add to mixing bowl and toss to combine. In a small mixing bowl, whisk together mayonnaise and vinegar until smooth. Add remaining dressing ingredients and whisk again. Pour dressing over pasta salad and toss once more. Chill in refrigerator for at least 30 minutes before serving. Store in airtight container in fridge. This entry was posted in Lunch, Recipe Book, Sides and tagged amish noodles, cookout food, creamy pasta salad, easy pasta salad, easy potluck recipes, easy recipes, party dishes, pasta recipes, pasta salad, pasta salad recipes, salami. Bookmark the permalink. 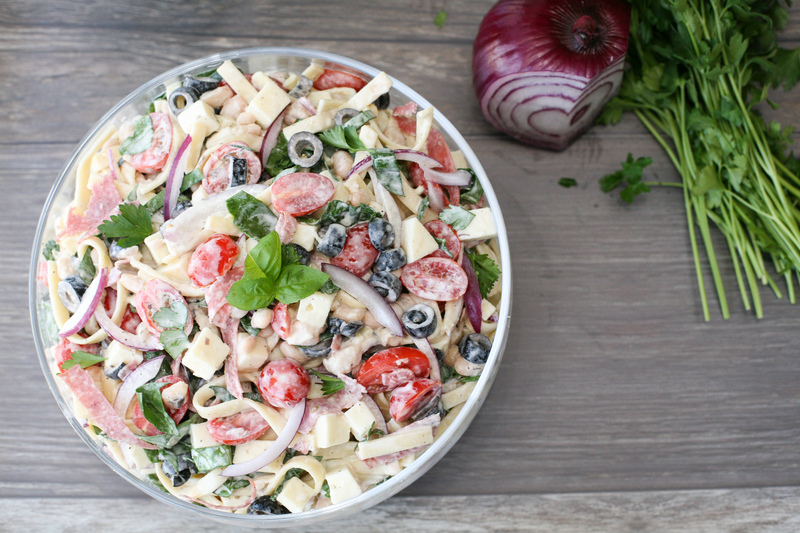 I love pasta salad especially in the spring and summer. It looks amazing! Me too, we make it for every cookout! Thank you for your kind compliment! !